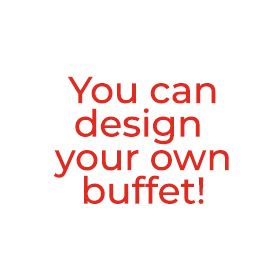 Betti’s Buffets are beautiful, extremely tasty and very generous. They can feed a small to a large crowd. 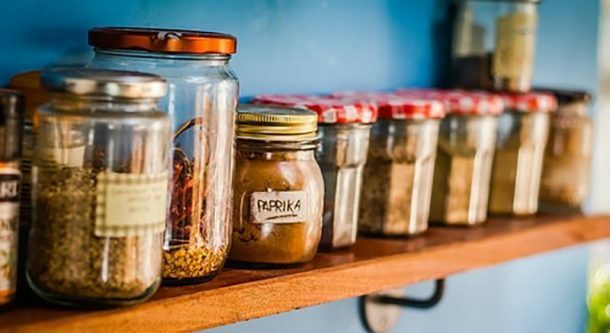 They are displayed on Tunisian and Moroccan hand painted dishes and round bamboo platters and decorated with sprigs of rosemary. But they can also be served on disposable foil trays if more convenient. It is possible to hire china for this service. Whole wheat originally from the Garfagnana area in Tuscany, dressed with an oven baked ratatouille made with courgettes, peppers, carrots, red onions and fennel, black olives, parsley, lemon juice and plenty of extra virgin olive oil. 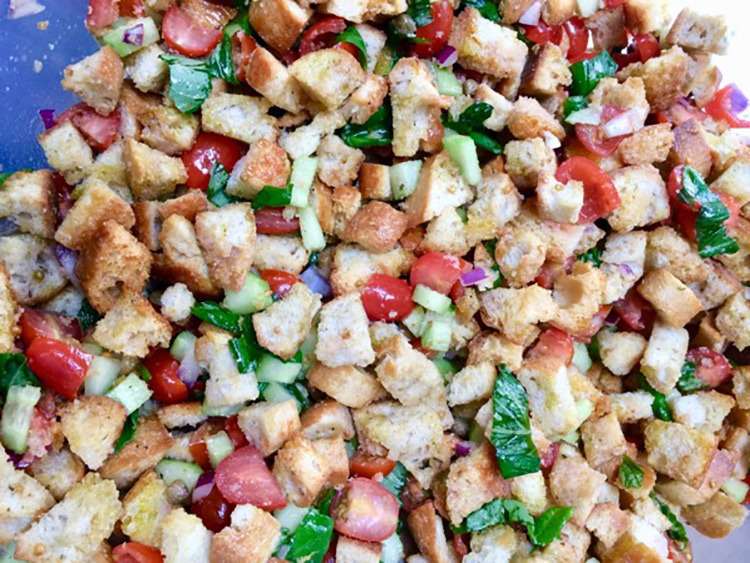 A traditional Tuscan summer salad made with bread croutons lightly soaked in red wine vinegar, fresh tomatoes, cucumber, red onions, capers and plenty of basil and extra virgin olive oil. 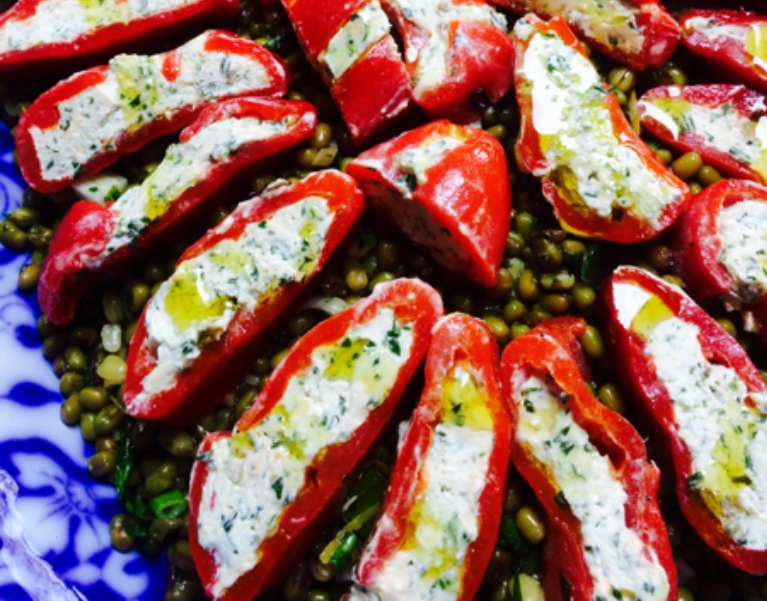 Red roasted peppers filled with a very creamy feta cheese flavoured with home grown capers, chilli and parsley cut in slices and served on a bed of mung beans dressed with spring onions, fresh chilli, lemon juice, extra virgin olive oil and parsley. A very colourful and summery salad made with Parma ham, nectarines, melon, different colours cherry tomatoes, pistachios, mozzarella, homemade pesto and raspberries and plenty of rocket. 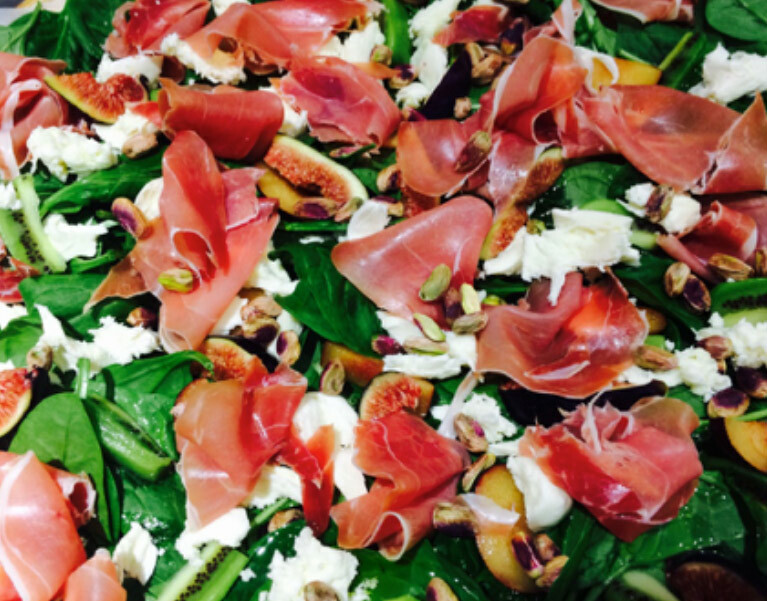 You can also have a more wintery version with figs, kiwi, spinach leaves and berries. 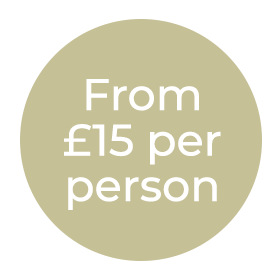 Roasted fillet of Beef, cooked medium rare, served at room temperature, sliced on a bed of rocket dressed with extra virgin olive oil, balsamic vinegar and shavings of parmesan and topped with a warm red wine jus. Italian version of this French classic. Homemade white pizza with slow cooked onions, thyme, anchovies and black olives. 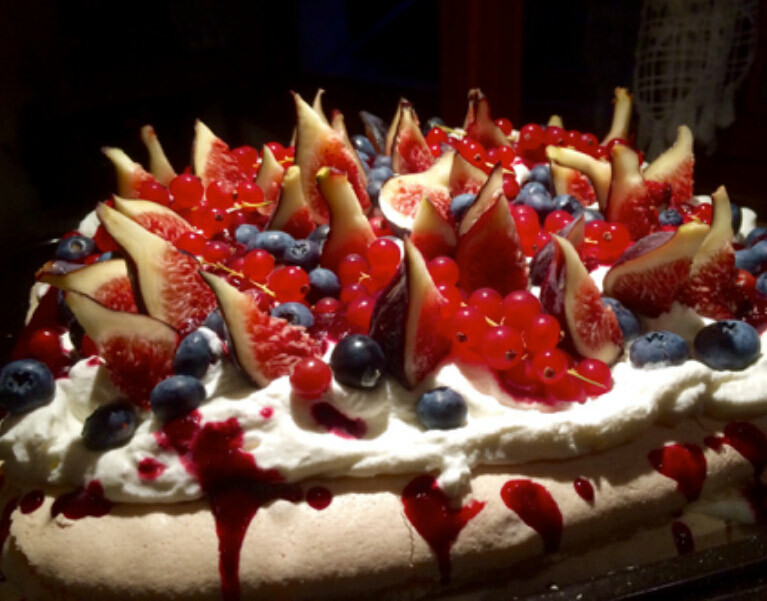 Two big squares of homemade meringue filled with whipped double cream, toasted almond flakes, a raspberry coulis and plenty of seasonal fruits, from figs to physalis or pomegranate to blueberries, apricots, cherries, redcurrants and strawberries served cut in squares. Whole wheat originally from the Garfagnana area in Tuscany, dressed with an oven-baked ratatouille made with courgettes, peppers, carrots, red onions and fennel, black olives, parsley, lemon juice and plenty of extra virgin olive oil. Flageolets and North Atlantic prawns salad with red peppers, parsley, spring onions and lemon rind dressed with lemon juice and extra virgin olive oil. Chickpeas and very good quality tinned tuna dressed with roasted red peppers, carrots, red onions, crunchy curly cucumber, parsley and lemon rind dressed with lemon juice and extra virgin olive oil. Red Camargue Rice with edamame beans topped with slow roasted beetroots, red onion, parsley and feta cheese, dressed with red wine vinegar and extra virgin olive oil. Quinoa, avocado, toasted almonds, orange segments, orange rind, rocket, spring onions and pomegranate seeds, dressed with extra virgin olive oil and lemon juice. Whole wheat originally from the Garfagnana area in Tuscany, very good quality tinned tuna, red onion, carrots, cucumber, peppers, black olives and parsley dressed with extra virgin olive oil and red wine vinegar. Pasta and Courgettes Salad Caserecce dressed with a light basil pesto, slightly fried courgettes, toasted pine nuts, currants, lemon zest, fresh basil leaves and home grown capers. Puy lentils, slow roasted beetroots, red onions, feta cheese and parsley, all dressed with extra-virgin olive oil and red wine vinegar. 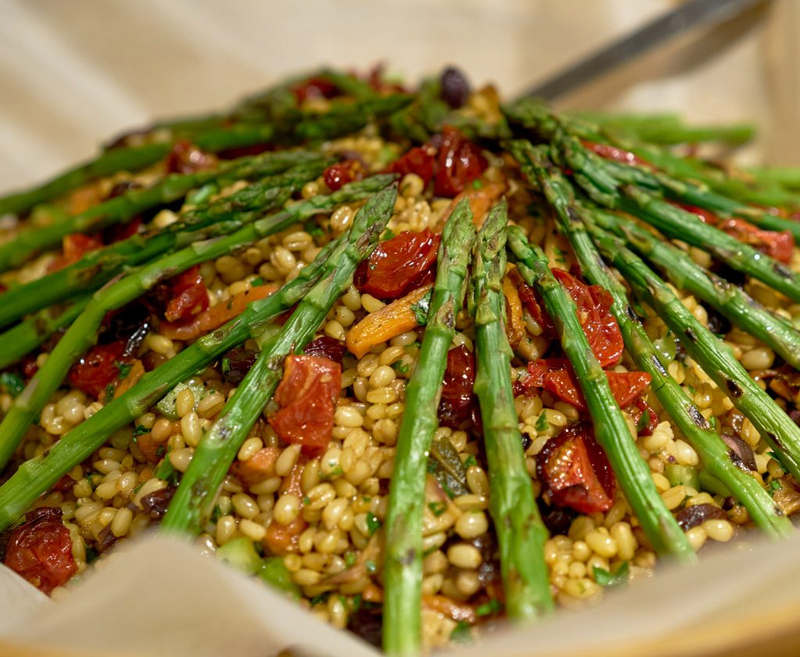 A type of whole wheat originally from the Garfagnana area in Tuscany mixed with the Sicilian classic Salad of orange, fennel and black olives. A refreshing but substantial salad made with chickpeas, Turkish cucumbers, tomatoes, red onions, carrots, sumac, lemon juice and plenty of parsley. Red Camargue rice and Quinoa dressed with fresh orange juice and zest, toasted hazelnuts, currants and rocket. 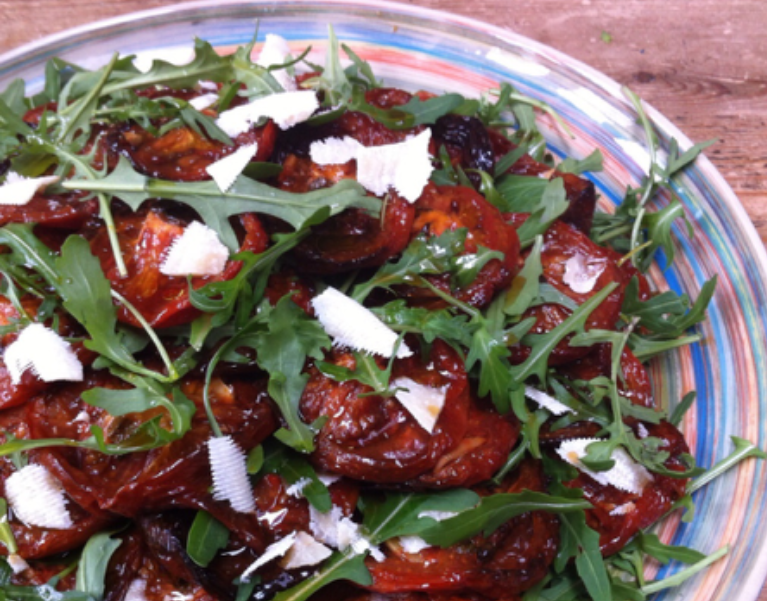 Giant and toasted couscous dressed with slow roasted tomatoes, fresh rocket and mozzarella cheese. Chickpeas dressed with lemon segments, fresh coriander, cumin, fresh red chilli and extra virgin olive oil. The classic Sicilian Salad made with very thinly sliced fennel bulbs and oranges, black olives and extra virgin olive oil. Very summery and refreshing salad made with watermelon, toasted pumpkin seeds and feta cheese. 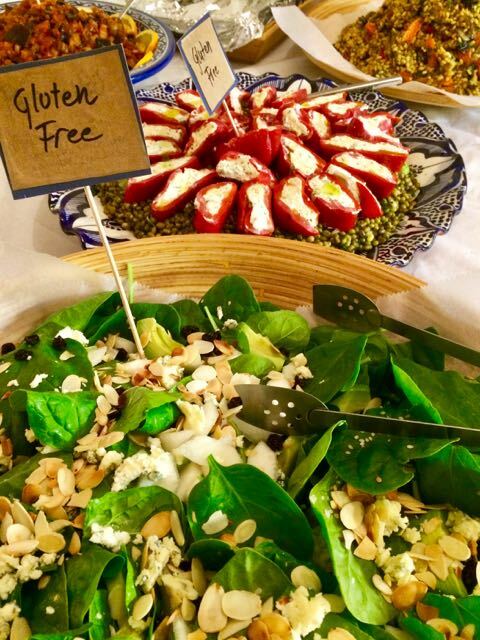 Baby spinach leaves, pear, avocado, mixed seeds, toasted flaked almonds and blue cheese dressed with balsamic vinegar and extra virgin olive oil. A very colourful and summery salad made with Parma ham, nectarines, melon, different colours cherry tomatoes, pistachios, mozzarella, homemade pesto and raspberries and plenty of rocket. 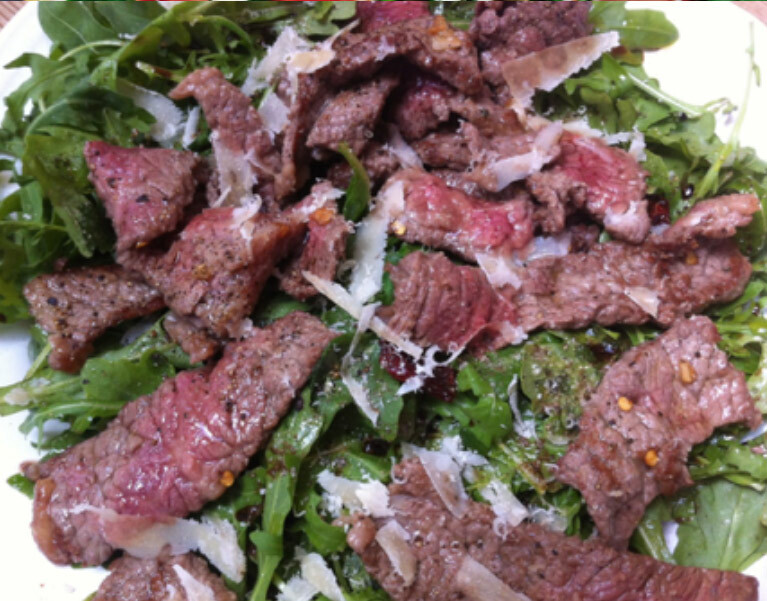 Dressed with extravirgin olive oil and balsamic vinegar. Green melon, raspberries, fresh mint and freshly squeezed lime, perfect to clean the palate. My mum’s meatballs made with mince pork and beef, thyme, parsley, garlic, parmesan cheese and nutmeg, fried and then coated in a tomato sauce with plenty of capers from my mum’s garden in Massaciuccoli, Lucca and basil. 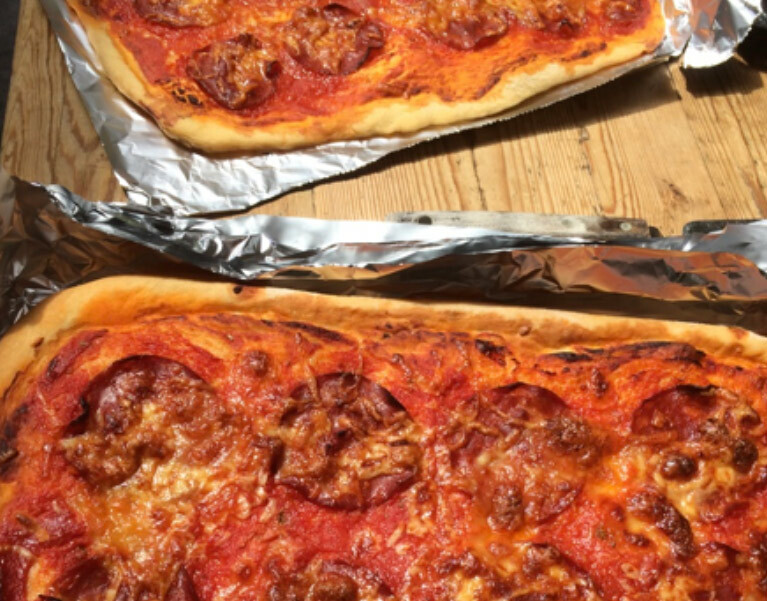 The Italian classic made following the secret recipe of my friend Giovanna. Made with beef and pork. It will be served warm and cut in small squares. With lots of herbs served with a white wine jus and a homemade salsa verde. North Atlantic Squid stuffed Sicilian style with breadcrumbs, currants, pine nuts, fennel seed, parsley and garlic. Served sliced on a bed of spinach with a white wine and parsley sauce. The traditional sweet and sour Sicilian dish of Arab origins made with deep fired aubergines dressed in a sauce of tomatoes, basil, green olives, celery, capers, pine nuts and currants. A very delicate and light Tart from Parma made with lots of courgettes and onions, delicious ricotta cheese from an Italian producer and plenty of parmesan, wrapped in very thin shortcrust pastry. Round tomatoes filled with tomato sauce, breadcrumbs, parmesan, pine nuts and currants and baked in the oven. Aubergine rolls (grilled aubergines filled with fresh tomatoes, mozzarella, parmesan cheese and basil, rolled up, covered in breadcrumbs flavoured with homemade pesto and baked in the oven. A Vegan option is available. Lasagne filled with béchamel sauce, plenty of Parmesan cheese, homemade pesto and fresh asparagus. Served cut in small squares. Homemade focaccia topped with fresh rosemary. 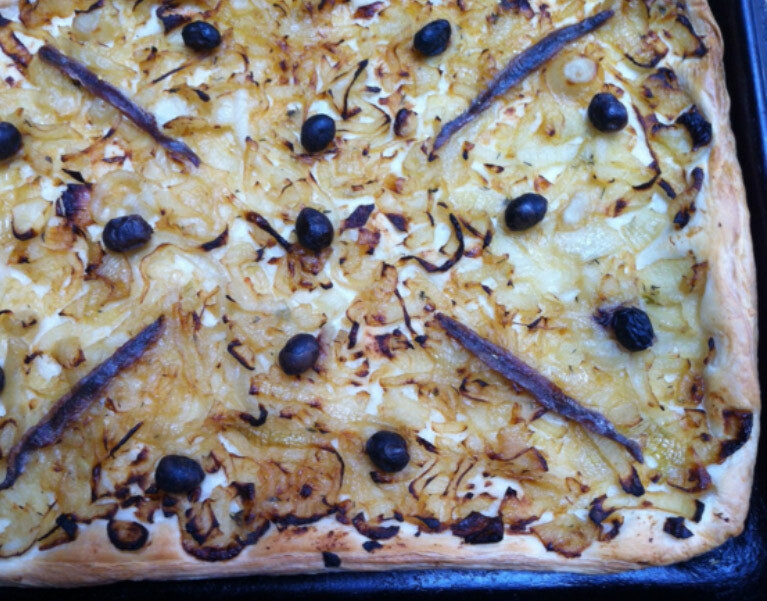 Homemade focaccia topped with slow cooked onions. Homemade focaccia topped with cherry tomatoes and Sicilian oregano.